MDS- Fun in the snow! After watching Patty Bennett's My Digital Studio webinar tonight I had a creative streak and decided to make a scrapbook page of Deborah and Mike playing in the snow! Hope you like it. 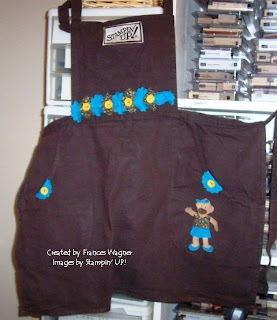 My friend and team member Polly gave me her brown Stampin UP apron recently and I wanted to spiffy it up a little bit. I saw so many cute ideas at leadership. Jill Olsen had a cute flowers on her apron and another presenter from Canada had a build a bear on her apron pocket so I decided to combine both ideas and make my new apron really cute and this is what I came up with. What do you think. I used felt for the build a bear and scrap fabric for the build a bear clothes and cut the flowers with the pennant scallops plus a dash of summer sun corduroy buttons to show off those flowers. Thanks for looking. 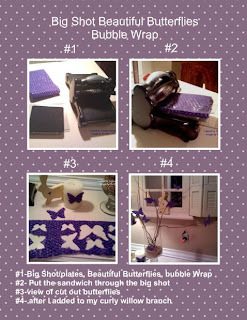 I finally got around to showing you my MDS tutorial for cutting the bubble wrap butterflies. Thanks for looking! 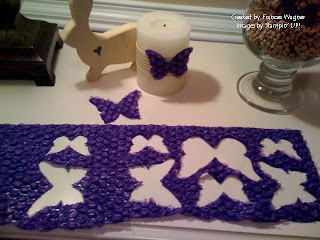 By the way those butterflies will be mailed tomorrow. Hope you like them. These are a couple of new Secret Sister Gifts I have gotten lately. I love getting new ideas in the mail. I have the greatest team. I am looking for new members especially during SAB when the demo kit is at a discount and you get an extra stamp set. No time like now. 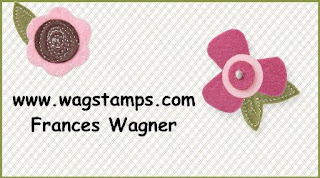 Contact me, if you could use some extra money and have fun showing your friends how to stamp. You can decide when you want to work and when you don't. I have had this fun job for 10.5 years and do not ever want to stop. Email me for more information. 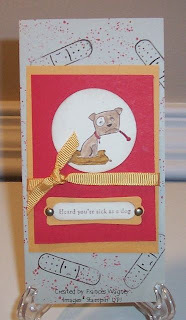 Have you ever thought about unusual ways to send mail? WOW someone that is not expecting fun mail. It is so much fun. 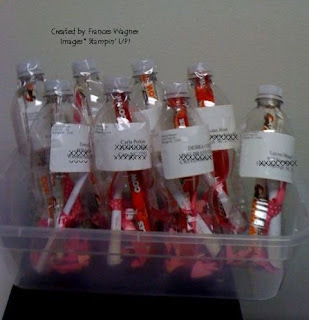 Earlier this month I mailed the bottles below to my top ten demonstrators on my team for sales performance. 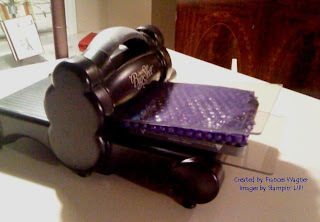 I typed up a message and cut it out with our Big Shot top note die (113643) and stamped the Stampin' UP's "Statement of the heart" on the other side along with stamping some hearts on it. I rolled it up (diploma style not sure if that is a real style) and tied a mellon mambo polka dot ribbon (115611)around it and added candy and punched out hearts to the unused, empty, dry water bottle and put an address label on it and put tape over the label and taped the top on. It cost about $1.59 to mail, depending on the weight of course. I Hope you like this idea and will surprise someone in your life soon. Thanks for looking. 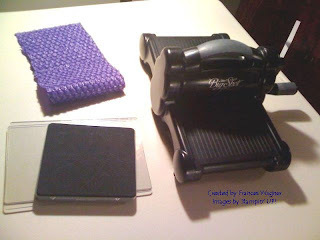 I know you have seen me using my big shot at classes, clubs, stamp camps and really wanted one for yourself but it may not be in your budget well I have the answer for you. I am offering the opportunity to get your own big shot on a budget sort of like layaway. Here are the details with two options. TO JOIN the Big Shot Club, you must have three buddies (4 total ) or be willing to wait until three others sign up independently..
Club members take turns "hostessing" workshops and receiving hostess benefits. (You don't really have a workshop in your home, but we do the paperwork as if you had.) Each person gets the big shot and the dies, and the person "hosting the workshop receives the hostess benefits. At the end 4 months everyone has a Big Shot and several dies (depending on the option your club decides on), a hostess stamp set, $15 in free merchandise. 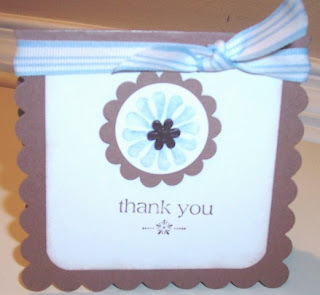 This was a fun box to make the top was made with the Petal Card Die and so easy. I cut the hearts using the Big Shot Hearts embossing die from a coke can and added a string and I love the way it turned out. The top of the box was made using the Petal Card Die cut from our Big Shot collection and a round scallop punch. I added the shred and a ribbon. Thanks for looking. My Stamping up team is participating in a secret sister swap for 3 months and I wanted to share the card I received from my secret sister. I love that she used different colors. It is so pretty. I can't wait to see what she makes for me next. Thanks for looking. 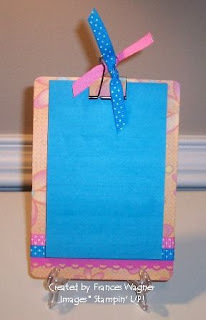 I purchased several of these bags at the Stampin' UP! Leadership conference in Phoenix last month and it could be yours. Just join my team in Feb and I will make you a cute tag to go on it for you. 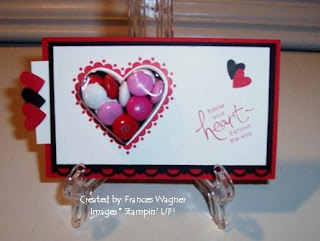 I got the tag idea from Patty Bennett except she used hearts and I used the Top Note Die from our Big Shot collection. I used My Digital Studio to create the background and then added a button and monogram, jumbo eyelet and brown stripped ribbon. Contact me today to get your own bag. 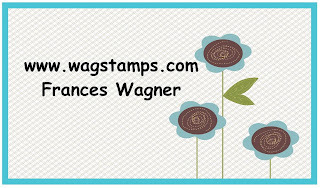 Saturday our stamp club met and we had such a good time stamping and just enjoying our friendship together. 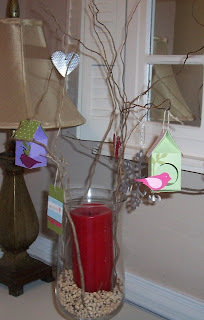 We made the birdhouses below using the milk carton Big Shot die in the occasions mini catalog. While at Leadership last month I saw Patty Bennett demo this darling birdhouse. 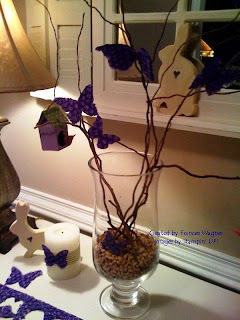 it is so easy you are going to want to make a bunch and fine a twig to attach them too. 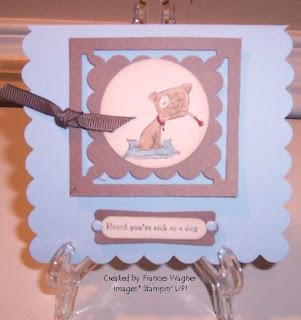 You will need Mini Milk Carton die (found in the Occassions Mini Catalog), a piece of 2x4 cardstock and Extra Large Two Step Bird Punch. You score the 2x4 card stock in half at 2" and assemble. Love notes: On Feb 1st, I decided to make valentine love notes for my husband and leave them in places he would find them during the day. Here are a few of the notes I retrieved from his desk. The first day I put one in the bathroom cabinet so he would find it when he brushed his teeth, next day in the cabinet next to the coffee, and in his sock drawer etc. It was fun to come up with different places and I will continue till Feb 14th. The first day he called me at work and said thank you for the sweet note it brightened my day. By day 4 he said I keep finding these little notes every day and he smiled. That was worth more than I can say. Just wanted to share with you.